Inflation: The People's Enemy. The Government's Friend. We can argue about the definition(s) of inflation until the cows come home - some economists spend a career trying to nail it down. But for clarity's sake, we'll use the definition of the Austrian School (Mises.org) as an increase in the money supply. This is really the correct one, regardless of any bias of dogma, "schooling" or the mainstream media. Although most everyone defines inflation as an increase in the price of goods and services, this is actually a result. 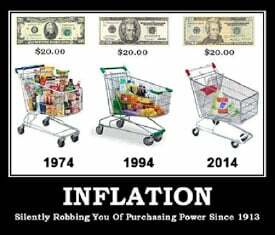 Most of us have been taught that inflation is all right as long as it doesn't get out of control. In the short term, it can benefit those able to manage cash flow in business or with real estate for which they can service loan interest and taxes. But over time, it's a safe bet that a period of rising prices will be detrimental to most of the population. Distortions in the economy increase to the point where it becomes almost impossible to determine the real price of anything. How much demand is attributable to a desire for consumption, rather than a hedge against higher prices? The truth of the matter is that inflation – at any level – is basically stealing! Things like an expanding money supply, increased "velocity," or rising prices due to demand-supply imbalance, add additional confusion. 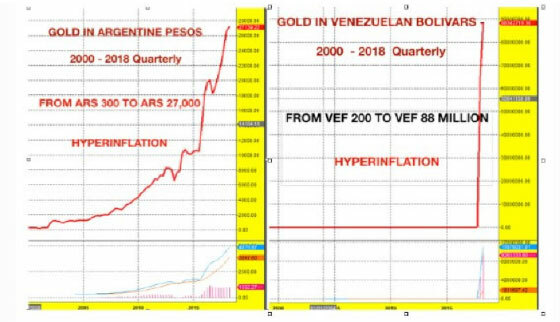 Last year, well before the current destructive inflationary moon-shot in Venezuela caused literally hundreds of thousands of impoverished residents to flee into neighboring Brazil and Colombia, it was rumored that an ounce of silver could buy a several month's supply of food; an ounce of gold, a house. Imagine their purchasing power now! At some point, as consumers fear their cash will soon become worthless, any item of perceived value is bought to get rid of a fiat that loses value daily. "Money" is literally gold (silver, too), brought into usable existence through planning and just plain work. Currency, created out of thin air at a Central Bank's whim is not! For a number of years, I have journeyed to Mexico, Argentina, Bolivia and Peru to research and write reports about resource sector companies for David Morgan's flagship newsletter, The Morgan Report. One of the things we noticed is that so many houses have rusted rebar pointing skyward. 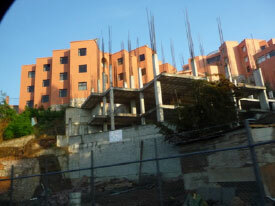 One answer we've heard is that "unfinished" houses are not socked with completion taxes. A more compelling explanation surfaced last spring during a visit to Dynacor Gold Mines (in which this writer holds shares) – a producer that, with the full support of the Peruvian government, buys and refines gold ore, at a fair-exchange price from certified small miners. Many had formerly been "artisans" – mining (and polluting) on the side. To show how pervasive the problem has become, it's estimated that in Peru alone, as many as 400,000 "informas" are mining, at great cost to the country's ecosystem! Towns through which we passed on the four-hour drive down the Pan American Highway to Dynacor's operations, sported a literal forest of rusted rooftop rebar. Because inflation, often leading to the destruction and issuance of a new currency has been the historic norm, citizens at all financial levels plow whatever disposable income they get into housing. When Richard Nixon took the U.S. off the last vestige of the gold standard in 1971, the historic role gold and silver had successfully played for thousands of years - limiting the debt which a government could accumulate in relation to its assets - was severed. Today the fiat printing press - now as much digital as actual - runs nonstop around the globe. All of us are negatively impacted by a policy - actually stated by the Federal Reserve - of creating inflation in order to stimulate the economy. What happens is that the government is able to run up unlimited debt, then "pay" for it later with depreciated dollars. Not to mention that, under various measuring schemes, the true rate of inflation is invariably underreported - see here. It continually distorts the things we buy, as well as retirement accounts and Social Security. Under present policies, your future payouts are guaranteed to purchase less than they do now. Ronald Reagan knew whereof he spoke when he wrote, "Inflation is as violent as a mugger, as frightening as an armed robber and as deadly as a hit man." It "mugs" your investment returns, "frightens" you into making unwise purchases, "robs" you via government and municipal taxation of illusory gains, and over many years, stealthily takes down your real wealth with the metaphorical finesse of what they refer to south of the border as "sicario" (a hit man). Inflation is the government's best friend, enabling debt repayment with constantly devaluing currency. It taxes you on phantom profits (the portion due to inflation rather than real gains) and distorts the price of goods and services, debasing people's ability to make sound decisions. Eventually it tears apart the social fabric, as witnessed today in the human tragedy that Venezuela – home to the world's largest oil reserves – has become. The Central Bank is an institution of the most deadly hostility existing against the Principles and form of our Constitution. I am an Enemy to all banks discounting bills or notes for anything but Coin. If the American People allow private banks to control the issuance of their currency first by inflation, then by deflation, the banks and corporations that grow up around them will deprive the People of their Property until their Children will wake up homeless on the continent their Fathers conquered. In 2011, Addison Wiggin wrote, "the most reliable government guarantee of all is the guarantee that a government will attempt to abrogate its responsibilities and default on its promises." The most effective and devious way in which they will (are doing) do this is via inflation. And you can take this idea to the bank... while, at the same time, the government is siphoning the value of your "money" away. The "big numbers" in today's financial markets have lulled most people into thinking that precious metals have had their day, and that a reset, based upon "value" determined by the blockchain is the next big thing. While anything is possible, it may be useful to contemplate the late Michael Ruppert's view that, "As long as you don't change the way money works, you change nothing."